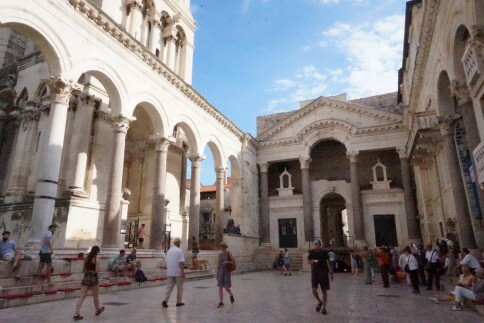 Today’s Split is both a monument to Diocletian and a solemn shrine to those he had executed. It’s that bit about the gas that gives the game away. This promising piece of lifestyle news comes not from one of today’s travel magazines, but from the June 1914 edition of Austrian tourist publication Der Fremdenverkehr. Split was edging tentatively towards a tourist boom in 1914, something that the outbreak of World War I soon put a stop to. Split’s star turn then was the same as it is now: the Roman palace, built for Emperor Diocletian at the start of the 4th century, that still forms the heart of the modern city. Few people are so central to the history of Split as Diocletian (245-311). And yet it is surprising how little we know about the man. The narratives routinely trotted out by tourist publications are frequently based on a consensus of suppositions rather than known facts. And with new interpretations emerging in the wake of every archeological discovery, the sands of historical record are constantly shifting. Diocletian’s status as founder of the city is celebrated throughout the summer in the Days of Diocletian (daily from mid-May until September 21), in which the Emperor arrives at a central piazza known as the Peristyle at noon, surrounded by a retinue of helmeted Roman guards. Putting this daily toga-party aside, however, there’s a surprising lack of a commercialized Diocletian cult in Split. If you’re looking for a Diocletian T-shirt, an imperial signet ring, or even a decent biography of Diocletian written in plain language, you’ll be going home empty-handed.